For other people named Harry Hill, see Harry Hill (disambiguation). 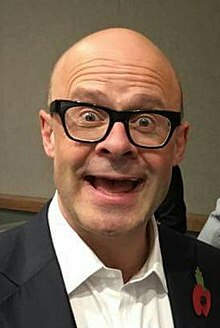 Harry Hill (born Matthew Keith Hall; 1 October 1964) is an English comedian, author and television presenter. He has narrated You've Been Framed since 2004, and hosted Harry Hill's TV Burp for eleven years, from 2001 to 2012. A former medical doctor, Hill won the Perrier Award for Best Newcomer at the 1992 Edinburgh Fringe Festival, and began his career in radio and television comedy with the radio series Harry Hill's Fruit Corner. His other projects include The Harry Hill Movie, released in 2013. Hill was born as Matthew Keith Hall in Woking, Surrey on 1 October 1964 and grew up in Staplehurst, Kent, where he attended the local primary school. At the age of 14, Hill moved with his family to Hong Kong for two years and attended Island School. there. He was later educated at Angley School and then Cranbrook School in Kent and St George's Hospital Medical School before training in neurosurgery at the University of London. Hill worked as a house officer at Doncaster Royal Infirmary, before quitting the medical profession because he "didn't feel in control of what was happening"; he is still registered on the General Medical Council's list of Registered Medical Practitioners. Hill achieved his breakthrough in 1992, when he won the Perrier Award for Best Newcomer at the Edinburgh Fringe Festival. Shortly after, a radio show starring Hill was commissioned by BBC Radio 4 entitled Harry Hill's Fruit Corner. Hill hosted the show as himself, and each week, he was joined by various guest performers, as well as regular character actors including Al Murray and Burt Kwouk. The show featured a variety of other celebrity guests during its run including Rolf Harris and Ronnie Corbett. Each programme is interspersed with Hill's stand up routines. Fruit Corner ran for four series on BBC Radio 4. Hill made his television breakthrough in 1994, when he starred in BBC Two black and white silent comedy series Harry Hill's Fruit Fancies. In a similar format to Fruit Corner, Hill performed a series of sketches, with a number of celebrity guests making cameo appearances. The series also featured one of the characters from Fruit Corner, three year old Alan Hill Jr. The series ran for six episodes on BBC Two between October and December 1994. For Christmas that year, a VHS containing a one hundred minute compilation of the best material from the series, as well as unseen sketches, was released by BBC Video. It has since become a rare item. From May 1997 onwards, Hill presented his own Channel 4 television sketch series, Harry Hill, which ran for three series between 1997 and 2000. The show was a television adaptation of Fruit Corner. Among the regular characters were Hill's big brother, Alan, played by comedian Al Murray, and his adopted son, Alan Jr., played by Dr Matt Bradstock. Burt Kwouk also appeared in many episodes of the programme, as Harry's "Chicken Catcher" – and each week, he would come up with an excuse as to why he has not yet captured a chicken, followed by a performance of the song Hey Little Hen. In later series, Hill and Kwouk appeared in sketches as Karl Lagerfeld and Gianni Versace. Hill's screen wife Mai Sung also made several appearances on the show, mainly around the theme of trying to steal his Abbey National bank savings book. Another character that featured on the show was Stouffer the Cat, a glove puppet cat made from blue rubber. Stouffer would normally sit in a throne, supported by a rubber arm in the style of Rod Hull, and was employed to intimidate guests during Hill's standup routines. Some of Stouffer's famous catchphrases are "he got a big face" and "sorted – respect due". At the end of each episode, an event called "The Badger Parade" was supposed to take place. The parade featured a number of puppet badgers that included Gareth Southgate badger and Tasmin Archer badger, among others – however, every week, there would be some kind of problem, resulting in the badgers being unable to perform. In place of the badger parade, Hill would usually sing a song, with a guest that he had invited onto the show. A tie-in book relating to the series was released in October 1998, entitled Harry Hill's Fun Book. The series was cancelled in April 2000, but was revived in March 2003, as The All-New Harry Hill Show, this time by ITV, who broadcast it along with episodes of TV Burp. Regular features on the ITV version included the Hamilton Challenge, featuring Neil and Christine Hamilton, and a butterfly in blue jeans. The Channel 4 series was revisited in August 2012, for a retrospective documentary entitled Whatever Happened to Harry Hill? As of 2017[update], neither the Channel 4 nor ITV series have been released on DVD. In October 2001, Hill moved to ITV in a lucrative deal, in which he created an all new show, Harry Hill's TV Burp, where he would take a look at the week's television, showing clips from various British television programmes, and framing them with commentary or intercutting additional footage. The series would feature a regular stable of all new characters, including the Knitted Character, a small, knitted rabbit, Wagbo, a demon love child whose parents are reportedly Wagner Carillho and Mary Byrne of X Factor fame, an interpretation of Heather Trott from EastEnders, played by Steve Bernham, as well as a doll of The Apprentice star Alan Sugar, who would regularly rap before clips of The Apprentice were introduced. The show was piloted in December 2001, before running for eleven full series between 2002 and 2012, before being cancelled to allow Hill to work on other projects. The show won a number of BAFTA awards, and spawned five Best of TV Burp DVD compilations, and a book based on the series, which was released for Christmas 2009. Main article: You've Been Framed! Since 2004, Hill has narrated the comical clips show You've Been Framed!, often shortened to YBF! replacing Jonathan Wilkes on the show. Hill has narrated 14 series to date. New episodes of You've Been Framed! are still being recorded and air early on Saturday evenings on ITV. In October 2005, Hill moved into new territory with Harry Hill's Shark Infested Custard, a thirteen part show broadcast in the CITV children's television slot, on ITV. While many of his well known characters, such as Stouffer and Garry Hill, his fictional layabout son from his first marriage, remained, it also showcased several new characters, including Speed Camera Boy, an outsider who is half boy and half speed camera, and Evelynne Hussey, a one-woman band who played a number of different instruments. While the show featured a game show element, Help the Aged, it was very similar in structure to Harry Hill. In the show, Hill wore a pale yellow, custard coloured shirt, with a giant collar, instead of his usual white collar. The series was never released on DVD; however, it did spawn Harry Hill's Whopping Great Joke Book, a book of children's jokes, released in 2006. The book was also made available as an iPhone application. A second book, Harry Hill's Bumper Book of Bloopers, was released for Christmas 2011. The Harry Hill Movie premiered in the United Kingdom on 20 December 2013. The film also stars Matt Lucas, Julie Walters, Johnny Vegas, Sheridan Smith, Simon Bird, Marc Wootton, Jim Broadbent, and band The Magic Numbers. The film sees Hill embark on a road trip to Blackpool with his Nan (Julie Walters) when he discovers that his hamster only has one week to live. The 88 minute film was directed by Steve Bendelack. To date, it has made $3,647,870 at the box office. and was released on DVD on 14 April 2014. Hill presented a revived version of the ITV talent show Stars in their Eyes. The series aired for six episodes from 10 January until 14 February 2015. The revival has proved divisive. Fans of the original format were critical of it, saying that Hill had made the show about himself rather than the contestants. In April 2015, it was announced that the show had been axed by ITV, due to extremely poor ratings. Tea Time saw Hill welcome guests to a spoof comedy kitchen and ask them to cook bizarre things. A new entertainment series for Sky 1, the first series debuted on 16 October 2016, and was viewed by 400,000 viewers. Ratings slipped the following week, when only 180,000 watched. Guests for the first series included Paul Hollywood, Joey Essex, Gok Wan, Martin Kemp and Jason Donovan. Harry Hill's Tea Time was commissioned for a second series which began airing in January 2018. In March 2017, Hill began presenting 6x30minute episode of Harry Hill's Alien Fun Capsule, which airs on ITV on Thursday nights, 8.30 to 9 pm. The panel show sees Harry welcoming two teams of two celebrity guests as they are tasked with saving planet Earth from alien invasion by sending evidence (via the "fun capsule" of the title) that Earthlings are good fun and therefore worthy of saving from destruction. Harry alludes to the premise of the show as being rather tenuous in a running joke during each show's introduction, before introducing the two teams of guests, usually a mix of comedians and television stars. In a similar style to Harry Hill's TV Burp, the show includes various clips from television and film, often attributed or related somehow to the current guests. The guests also partake in sketches and songs based on or directly spoofing the funny or bizarre items featured. There is a regular slot entitled "Local News Round Up", accompanied by its own theme tune, which involves each of the guests taking turns to read out bizarre headlines from local newspapers. Alan the Alien also appears as a green extra terrestrial's arm, emerging from a box to aid Harry in some way. The series has received positive reviews, with many pointing out the similarities to TV Burp. The show moved to Saturday Evenings between 7.30 pm and 8.00 pm for a second series, aired in 2018. In 2002, Hill published the first in a series of novels and books he had written, entitled Flight From Deathrow, based around the accounts of the unlikely antics of real-life celebrities and politicians, as seen through the eyes of the storyteller, as he drifts in and out of a coma. His second book, Tim the Tiny Horse, was published in October 2006, and featured the tale of a small horse who had to wear glasses because of poor eyesight. Hill's third book, The Further Adventures of the Queen Mum, was published in October 2007, and was a comic take on the life and times of the Queen Mother. His fourth novel, Tim the Tiny Horse at Large, which is a sequel to the first book, was published in October 2009. Another novel, A Complete History of Tim (the Tiny Horse), was released on 1 November 2012. In 2010, Hill released Livin' the Dreem, a fictional account of a year in his life, featuring references to pop culture. The book was reprinted in May 2011, with additional entries for events that occurred between January and April of that year. A Complete History of Tim (the Tiny Horse) was published in November 2012 which contains the first two Tim the Tiny Horse novels, with four new stories. Hill's instantly recognisable voice has led to work in many voice over roles on television commercials. Advertisements that Hill has provided a voice over for include the holiday adverts for Boots in 2004, the "Bring on the Branston!" adverts for the Branston Pickle brand during 2006 to 2007, adverts for the Green Flag car breakdown service, and adverts for the new yogurt, Danio by Danone. He also sang in 2001 "This Charming Man" by The Smiths as Morrissey in Stars in their Eyes. In February 2001, and again in April, Hill appeared on Lily Savage's Blankety Blank. Hill has also appeared as a guest on the BBC Radio 4 series I'm Sorry I Haven't a Clue, in the ChuckleVision episode "Mind Your Manors", the first episode of the twentieth series, and as Joon Boolay in the Sky Atlantic sitcom This is Jinsy. In October 2006, Hill presented his own episode of long running ITV series, An Audience With..., in which he revived several characters from Harry Hill. On 4 October 2004, he also appeared in an episode of Room 101. In November 2010, Hill released his debut comic album, 'Funny Times'. The album was preceded by the singles 'I Wanna Baby', 'SuBo', and 'Ken! ', which features William Roache, as his Coronation Street character, Ken Barlow, is the feature of the song. Since October 2010, Hill has had his own comic strip in The Dandy, entitled Harry Hill's Real Life Adventures in TV Land, drawn by Nigel Parkinson. Hill was directly involved in its creation and is co-credited with Parkinson. Between October and December 2010, Hill starred in a weekly online comedy series on the ChannelFlip website, entitled Harry Hill's Little Internet Show. Ten episodes of the show were broadcast online. In 2003, The Observer listed Hill as one of the fifty funniest acts in British comedy. In 2005, in a poll to find The Comedian's Comedian, he was voted amongst the Top 50 comedy acts ever by fellow comedians and comedy insiders. In 2007, Hill was voted #5 on Channel 4's hundred greatest stand ups. On 13 December 2006, Hill won two Highland Spring British Comedy Awards, over the favourites Ant and Dec, which Hill made light of in his acceptance speeches. In 2008, he won two BAFTAs, and another in 2009 for Best Entertainment Performance. In 2009, he won two British Comedy Awards, making it his sixth award. He also won again in 2011, but was unable to be there and sent Wagbo to collect it on his behalf. He was also nominated for 3 other awards, including the People's Choice Award, which was won by Miranda Hart. Hill married artist Magda Archer in 1996, in Wandsworth, London. They have three daughters, all born in Kensington and Chelsea, London: Kitty Clover Hall, Winifred Millicent Hall and Frederica Aster Hall. He now resides in the seaside town of Whitstable, Kent. In February 2006, Hill was a victim of identity theft; a sum of £280,000 was stolen from his bank account. In September 2008, Hill worked with Fairtrade to release Harry's Nuts, a brand of fairtrade peanuts. He is a supporter of the football club Harrow Hill F.C., also known as Harry Hill F.C. In 2008, he was presented with a Harrow Hill badge, which he subsequently wore regularly on episodes of his television series Harry Hill's TV Burp. On 17 July 2014, Hill was awarded an honorary Doctorate of Arts by the University of Kent, in recognition of his contribution to television and the arts. On 25 August 2016, Hill became a patron of Action Duchenne which funds research for Duchenne muscular dystrophy, and fights for improved standards of care. ^ "Woking Borough Council, Hall of Fame". Archived from the original on 15 April 2010. Retrieved 20 April 2010. ^ a b "Harry Hill: 'There's no such thing as healthy eating'". theguardian.com. Retrieved 15 March 2014. ^ a b "Marriages and Births England and Wales 1984–2006". Findmypast.com. Archived from the original on 28 February 2009. Retrieved 15 June 2009. ^ "7 things you never knew about Harry Hill". Sunday Mercury. 28 February 2010. Retrieved 3 April 2011. ^ "Doctor Who? Harry Hill's secret past and 5 more career-change comics". ^ "Harry Hill's Whopping Great Joke Book – The app for iPhone and iPod Touch". Harryhillsjokebookapp.com. Archived from the original on 19 October 2011. Retrieved 24 October 2011. ^ "'The Harry Hill Movie' premieres first trailer – watch video". Digital Spy. Retrieved 19 October 2014. ^ "The Harry Hill Movie gets 20 December UK release date". BBC News. Retrieved 19 October 2014. ^ "The Hobbit holds off Anchorman 2 at UK box office – top 10 in full". Digital Spy. Retrieved 19 October 2014. ^ "Harry Hill's Stars In Their Eyes Episode 1". ^ "Stars in Their Eyes: Has it been axed?". 17 April 2015. ^ Hyland, Ian (10 March 2017). "Harry Hill's superb Alien Fun Capsule is a bit like TV Burp repeating itself". ^ "What is Harry Hill's Alien Fun capsule on ITV? Is it any good?". ^ "ITV recommissions Harry Hill's Alien Fun Capsule". ^ "Harry Hill's Alien Fun Capsule gets a second series". 18 April 2017. ^ "A Complete History of Tim (the Tiny Horse)". Amazon.co.uk. Retrieved 19 October 2014. ^ Lily Savage's Blankety Blank. 29 April 2001. ITV. ^ "Daily TV round-up – Harry goes drag in new comedy". Yahoo! TV. 2011. Retrieved 28 July 2011. ^ Kennedy, Adam. "BBC - Music - Review of Harry Hill - Funny Times". www.bbc.co.uk. Retrieved 24 January 2019. ^ "Harry Hill's Little Internet Show". The Guardian. 22 October 2010. Retrieved 29 December 2010. ^ The Comedy Zone Humor Network. "Harry Hill : Comedian Profile". Comedy-zone.net. Retrieved 15 June 2009. ^ "Television – News – British Comedy Awards 2006: The Winners". Digital Spy. 13 December 2006. Retrieved 24 October 2011. ^ Smith, Aidan (16 January 2005). "Harry on Laughing – Scotland on Sunday". Scotlandonsunday.scotsman.com. Archived from the original on 10 January 2009. Retrieved 15 June 2009. ^ Leyden, John (9 February 2006). "Harry Hill ID Fraud". Theregister.co.uk. Retrieved 15 June 2009. ^ "Action Duchenne delighted to welcome Harry Hill as new Patron". 25 August 2016. Archived from the original on 13 September 2016. Retrieved 25 August 2016. ^ Jones, Kirsten (20 August 2016). "Harry Hill on Tea-Time: It's a comedy cookery show – with no cooking!". ^ "Inspection, Series 1, Life on Egg - BBC Radio 4". BBC. Wikimedia Commons has media related to Harry Hill. Jonathan Wilkes Host of You've Been Framed!